Registered Nurses (RN) are integral members of any medical facility. They are basically employed in hospitals, private clinics, nursing homes, residential care facilities, schools, community clinics, elderly healthcare facilities and many other places. The basic duties of a Registered Nurse includes treatment, administering medications, screening health conditions, diagnosing their conditions, completing medical charts, and providing emergency care to the patients. Get the proper basic education: Registered Nurses can be distinguished from other classes of nurses by their higher level of training and education. To become a registered nurse, you must have high school diploma or a GED. For students who are still in high school, they should give attention to their science course mainly biology and chemistry because these are mainly used in the medical field. They also take the SAT or ACT exams to get admitted to a good undergraduate college. Get the proper Advanced Education: Apart from your regular studies, you should also get the appropriate advanced education to succeed in this field. For this, there are four major paths that you can follow. They are master’s degree in nursing (MSN), a bachelor’s of science degree in nursing (BSN), an associate degree in nursing (ADN), and a diploma. Among these, the most widely used path is the ADN program. The Associate Degree in Nursing (ADN) is a two year associate degree program offered by junior and community colleges. The Bachelor’s of Science degree in Nursing (BSN) is a four years course offered by colleges and universities. The diploma program is a three years course offered by hospitals and nursing homes. Registered Nurses with an ADN or diploma also choose to pursue a BSN degree which is also known as RN to BSN program that prepares student for a wider extent of nursing practice. Additionally, Accelerated MSN (Master’s Degree in Nursing) programs can also be pursued by combining a year of BSN program and two years of graduate studies to hold a MSN degree. Pass the NCLEX-RN exam: In all the states and territories of the United States, including the District of Columbia, students wishing to work as a Registered Nurse are required to pass a national licensing exam known as the NCLEX-RN exam. The National Council of State Boards of Nursing develops and administers the NCLEX-RN examination. The NCLEX-RN examination is accepted by every state as an indicator of having passed the minimum knowledge and skills required to work as a RN. The NCLEX-RN exams are aimed in testing the knowledge and skills of a RN graduate to work effectively as a RN in medical facilities. Those students who wish to take the NCLEX-RN examination should check with the Board of Nursing in their respective state to find out what they need to do. 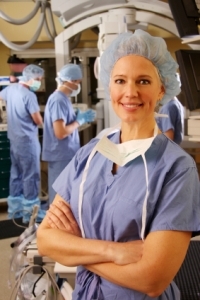 Registered nurse commonly stands for RN. RN is the person who has acquired the degree up to bachelor level with the comprehensive licensing test. The hospitals, doctors’ office, emergency ward, health clinic and school are some of the working area of the RNs. Some registered nurse travels throughout the nation as the freelance nurse gaining experience in the remote health sector. Now if are wishing to be the RN then here are some points that will help you. You have to be perfectly skilled in your math and science in your high school. Especially in chemistry, biology, algebra and calculus. You have to give the formal exam of SAT and ACT. There will be high competition for the admission in the undergraduate level. You should be geek as to be at the top of the list with the grade of above 3.0 in the college yourself in order to be in the desirable nursing college. You must be fluent in foreign language with at least 2 year course as well as 3 years math and science and 4 years of English classes in the undergraduate level. Decide yourself what kind of certificate you need. You can have different type of course in the nursing field that need different requirement. You can choose the associate degree in 2 year or the bachelor degree in 3year. While if you choose the BSN after associate level, it will take 2 more year in additional. Many of the school don’t have the nursing course, so choose the right college you want to attend. These colleges will require some prerequisite course that should be completed and hence you can apply for the nursing course. Firstly you have to pass the NCLEX (National Council Licensure Examination). This is the complete test that you must pass before you get the license. You can visit to the Nursing Board in your state to check for the NCLEX exams. In order to continue the practice in nursing, you have to study further beyond the associate or Bachelor degree. So keep your study in continuation. If you have made up your mind with the nursing career, it will take you many years of education and large sum of money. First you have to find the appropriate nursing school for your nursing program. Once you become a nurse, think this career as vey emotionally charge one. Consider the finances you have. You will not be the nurse in a single night. It takes years of study, text books and the fees. Talk to the finance aid office to deal about the scholarship, student loans in your school. Read more How to Become a Certified Nursing Assistant (CNA)?